Mr. President. Why not give your promise to double the Peace Corps the same priority you have given to starting the "Volunteers for Prosperity" by lobbying for the full $359 million dollars in your FY2004 Peace Corps budget request? 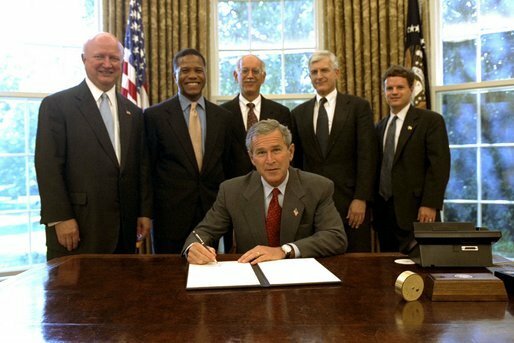 Read and comment on this story from The Guardian on the executive order President Bush signed on September 25 implementing the "Volunteers for Prosperity," a new program coordinated by USAID that will fund volunteers to work with nongovernmental and voluntary service organizations overseas. In his state of the Union address before Congress in February 2002, President Bush promised to double the Peace Corps by 2007. As one step in meeting that goal, the President asked for $359 million dollars for the Peace Corps for FY2004. This budget request has already been cut by $45 million in the House of Representatives. The Senate has yet to vote on the measure and there is hope that an amendment will be offered to restore these funds. But without President Bush's support, the restoration of funds appears unlikely. WASHINGTON (AP) - Highly skilled? Willing to travel? An executive order President Bush signed Thursday helps to give doctors, nurses, economists, engineers, computer specialists and tens of thousands of other well-schooled Americans an opportunity to volunteer to work on development projects overseas. The order implements "Volunteers for Prosperity" - a call to service to support major U.S. initiatives that promote health and prosperity around the world. The program, a component of the White House's USA Freedom Corps, compliments Bush's commitment to double funding for the Peace Corps during the next five years. There is a backlog of 200,000 inquiries for 7,600 Peace Corps slots, according to John Bridgeland, a White House domestic adviser and director of the USA Freedom Corps. "We know we have this pent up demand around the country - people who want to work on initiatives abroad," he said. "This order sets up the infrastructure that will give them easy access to information and ways in which they can be deployed for flexible terms to meet their schedules." Volunteers in the program will be able to serve in the country of their choice, for however long their particular project takes. The new program tap volunteers for weeks or months, versus a two-year commitment typically required by the Peace Corps, Bridgeland said. Bush announced the new initiative in May during a commencement address at the Coast Guard Academy. "Like generations before us," Bush said, "this generation of citizens will show the world the energy and idealism of the United States of America." Since May, the Volunteers for Prosperity program has signed up 40 non-governmental groups interested in taking on volunteers, Bridgeland said. "A doctor from Virginia, for example, who wants to work on HIV can go through the USA Freedom Corps volunteer network, volunteer to work in Africa for a non-governmental organization that's receiving federal support," Bridgeland said. Volunteers might work fighting AIDS as part of a U.S. prosperity initiative called The Emergency Plan for AIDS Relief, he said. Another volunteer, working under the Digital Freedom Initiative, might end up helping a rug maker in Senegal learn how to use technology to sell his wares. Other possibilities include the Water for the Poor Initiative, the Trade for African Development and Enterprise Initiative, or the Middle East Partnership Initiative, which helps educate illiterate Arab women. RE: VIPS...Volunteers for Prosperity. The good news is that the need for trained personnel, particularly medical, is so great and this program should help meet that need. The bad news is 1) this is direct competition for the Peace Corps; 2) VIPS would be assigned to American based NGOs not host country programs and of course, 3) that pesky prohibiton against comingling with intelligence gathering evidently would not apply to VIPS. Peace Corps does not,and never has (had),competition. Let me clarify, Anon. Peace Corps has to compete with other organizations for talent. Peace Corps requires a very expensive committment on the part of its volunteers. Qualified people who can not afford to give up a salary for two years do not consider the peace corps and the peace corps loses those qualified people. The military benefit package is much more attractive and the peace corps can not compete with that advantage. One of the great strengths of this country is people who know poverty first hand and/or are immigrants. These are prescisely the groups which have been underrepresented in peace corps because it costs so much to serve. Now, the VIPS program will be able to offer professional people a shorter, more structured and perhaps safer, opportunity to serve. Those are people who will not go into the peace corps. VIPS reduces the pool of specifically trained potential peace corps volunteers. Or at least, that is how it appears to me. I am not surprised by the new program. Nixon tried to aim for "experts" to incorporate into the Peace Corps. Nixon just didn't try to raise the monthly stipend. The whole idea was to get people who Nixon (and his henchmen) thought wouldn't be as "idealistic" as the Volunteers recruited during the Kennedy and Johnson years. I think Nixon did change the character of Volunteers to a moderate extent, but he was not entirely successful. At least the Bush Administration is doing it outside the Peace Corps itself. Maybe the increased stipend will help get the "professionals" they may be looking for, but it won't help the Peace Corps. 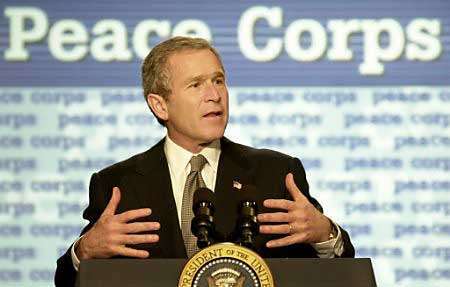 It will just allow Bush (and his henchmen) to claim he doubled the Peace Corps, when he in fact didn't (and won't). Of course, the focus on the Volunteers is what seems to be desired. By focusing on the Volunteers, we are likely to forget about the people served. If the people served are helped by this Executive Order, Hooray! If not, it is only what one might expect from an Administration that selected a failed County Executive, with Zero Peace Corps experience, for Director of the Peace Corps. Mr. Bridgeland (the Administration's man in the Freedom Corps) states that it is hoped that "tens of thousands, hundreds of thousands" will eventually join the new program(s) as "Volunteers for Prosperity." This would include doctors, nurses, and other professionals sorely needed... in the Peace Corps. So... why can't the President and Congress fully fund Peace Corps, instead? Clearly, the White House has no aspirations or will to make Peace Corps a stronger organization. 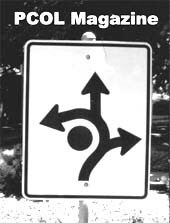 Looking at the unilateral foreign policy choices, the foot-dragging on consensus building, and the speed at which the Administration resolves to demonize, attack, or alienate countries whose ideologies (and available underground resources) are richer and more distinct than our own, it is evident that the goals of Peace Corps are not synchronous with the goals of the Administration. The current Administration (as a whole) has grudgingly, more or less while being dragged along (kicking and screaming), been cajoled into supporting legislation that would support Peace Corps. The President, on the other hand, has proposed and requested significant funding to support the new legislation for Peace Corps, but hasn't the political will to stump for it, so the appropriations are in danger of falling by the wayside. The lack of effort to make Peace Corps appropriations happen is in no small part because Peace Corps Volunteers (and Peace Corps, as an independent agency) are not quite as within the control of the extremist Administration as would be the so-called "Volunteers" which would populate the "Volunteers for Prosperity." Bridgeland's hordes of "hundreds of thousands" of such "Volunteers," should such a nightmare occur, would only draw professionals away from the Peace Corps (whose goals are improving, by the looks of recent legislative action) and place them in an organization whose goals are at best, questionable. Another reason for the difficulty obtaining Peace Corps appropriations (in lieu of new funding for untested and questionable programs) is that Returned Peace Corps Volunteers and their families are not active enough in petitioning Congress and the President to make it happen. 3. PUBLICLY OPPOSE Bridgeland's recent proposals for funding of "tens of thousands, or hundreds of thousands" of the so-called "Volunteers for Prosperity," as this would wrongly divert professionals from joining the Peace Corps and would populate an organization that at best, has a questionable mission and a thinly-hidden, non-compassionate agenda. Please COPY these three items (above) and SEND them as a REQUEST to your elected representatives by linking to http://www.capwiz.com/y/dbq/officials - Once you have entered your zip code and have "clicked into" the text entry section, PASTE these three items into your message. This takes only a minute of your time. "Upon the request of the Chair, and to the extent permitted by law, the heads of executive branch departments and agencies shall provide the Council with relevant information." In this case, the Chair is the President of the United States, and the members of the Council include the Attorney General, the Director of the U.S. Peace Corps, and other executive branch heads. "The Attorney General shall, in consultation with the Director of Central Intelligence, carry out a program to provide appropriate training to... officials of the Federal Government who are not ordinarily engaged in the collection, dissemination, and use of foreign intelligence in the performance of their duties, and officials of State and local governments who encounter or may encounter foreign intelligence in the performance of their duties, to assist such officials in identification and utilization of foreign intelligence information." Clearly, this legislation provides a mechanism where, in combination with section 3(f)(iii) of the Executive Order ordering the creation of the USA Freedom Corps, intelligence information will be passed from Peace Corps to the Attorney General, and from there to the Central Intelligence Agency, by order of law. In the President's 2003 Budget Initiatives for "Using 21st Century Technology to Secure the Homeland," an increase from zero dollars (2002) to 17 million dollars (2003) will be spent specifically to "assure _relevant information_ is conveyed to State and local officials" for defense purposes. This same language is seen in Section 3(f)(iii) of the USA Freedom Corps Executive Order: "...the heads of executive branch departments and agencies shall provide the Council with _relevant information._"
Is foreign intelligence information part of this "relevant information?" Regardless of the intent of the legislation and Executive Order, there is nothing to legally prevent "intelligence information" from falling into the category of "relevant information." Documents obtained under Freedom of Information Act requests from the NSA (National Security Agency) confirm that the definitions of "foreign intelligence" and "relevant information" as used by that agency are not mutually exclusive. URGE CONGRESS TO DO ITS DUTY AND SUPPORT THE PEACE CORPS AND THE PEACE CORPS ACT! Your children (and grandchildren) will thank you. Has anyone seen the usafreedomcorps.gov or vfp.gov sites? Have you plugged your information into their form? It's basically a volunteer search engine and the responses I received were all from Idealist.org. This is most concerning. I find it ironic that the president would establish such an organization at a time where Peace Corps is taking unprecendented heat in the media and Congress. Interesting how it intersects with the time of Peace Corps' budget determination. It is also amazingly coincidental that Gaddi Vasquez resigned (or not?) last month. USA Freedom Corps has become a kitschy propaganda machine for the current administration, littered with cheesily captioned photos of our current president engaged in boyscout-like activities. What is going on here? The political stench is overpowering and I fear the motives between the lines. Bush never really hired anyone. People expected Homeland Security, Freedom Corps/Volunteers for Properity to hire alot of people. Bush's genius was a combination of existing agencies/NGOs. Genius, whew!!! What is the national debt? I call. I call them to point out the volunteers that were killed who lived in California. The number of volunteers who were alone as a victims of violence. I send the photos and descriptions of every volunteer who has been killed, died or missing in service so they can understand the magnitude of the problem within the Peace Corps. Especially volunteers who were treated poorly by the agency and who have gone through a situation like this. Our provisions may be placed in the language on the next Peace Corps budget because many Senator's and Congressman and woman know the way Peace Corps treats its own and is arrogant in changing two volunteers at every site. Does the Norcal group support 2 Volunteers at everysite which is being discussed on the hill? Does your group support and write to your Congressmen and women that victims of violence in Peace Corps should have an attorney working for them? Do you want the Feca program revamped so that victims of violence of Peace Corps are trained as employees of Peace Corps so that when someone calls they are treated empathetically? Attrition rate goal in the agency at 5%. Not a goal of firing people through Medical services, safety office or through their country desk? Does your group support a Conflict Management office so that two parties can resolve differences of Persceptions of service and that probably in the thousands would be able to return to service and possibly get some compensation because of the way they wrongfully treated by Peace Corps? These are just some being proposed. I hope you support us as RPCV's too. I agree with you on the Patriotic Act provision. You would be surpised. They may be already using it without Congressional approval. Soon, the democrats, who actually control the economy,war,and America, will fix the ('Its the EconomyStupid') economy and save America! from its national debt.